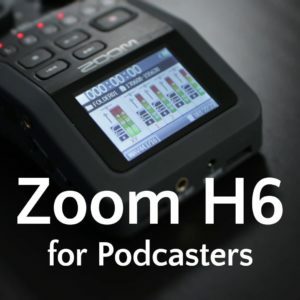 Interviewing non-podcasters presents many challenges, so here's my advice to ensure you get the best sound quality possible from your podcast guests. This has been one of the most-requested topics. More recently requested by Max Flight, Onai, Jeremy Jackson, Candice Jones, and Mike Rapin. 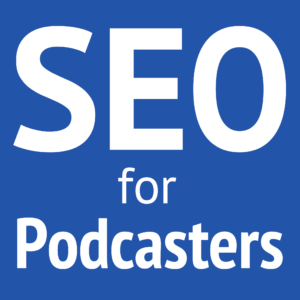 Thus, the following tips will help you find a balance of audio quality and other factors so that you can deliver the best podcast reasonably possible. Your guest is doing you a favor by being on your show. They're already taking time out of their busy schedules to spend it with you, often times knowing that they may not get much value in return. So why make it difficult for them? Shipping microphones, using multi-ender recording tools, and more can be great ways to ensure the utmost audio quality from your guest. But using any of these could be a bit too much for your guest, especially when it requires installing apps, creating accounts, connecting equipment, and such. For some guests, even getting Skype could be too much to ask! So work with what you can. If your guest has a smartphone, that may be the easiest option that also returns the best results. Installing and using apps—Skype, FaceTime, Ringer, or anything else—may be easier than on a computer. Plus, most smartphones have really good microphones, so you only need an app to use that good microphone. Thus, having your guest use a voice over IP (VoIP) app on their device, but holding their device as if they were making a phone call puts that high-quality microphone near their voice. Using the handset also reduces the chances of rustling noises, filtering, and other issues that can negatively affect the audio quality through any kind of headset or earpiece. If this isn't possible, compromise and accept a standard phone call. What's more important: that all your guests have great audio quality but you can't get the guests you really want, or that you get the guests you want but with lower audio quality? Your audience consumes your podcast because of the messages you share, not because of the audio quality and maybe not even because of the guest themselves. Thus, it's far more important for you to bring those messages to the world than to obsess over getting pristine audio quality. Yes, try to get the best results you can. But don't sacrifice a great message simply because the audio isn't studio-quality. 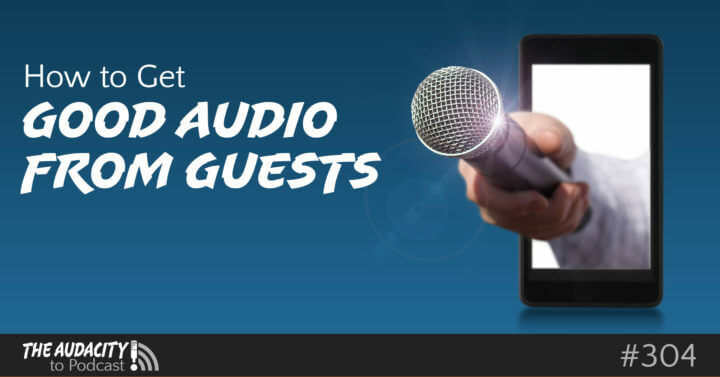 As long as your audience can hear and understand your guest and their message, the audio quality is acceptable. We're actually quite used to this kind of mismatch. In radio and television, it's quite common for special guests to be joining through a simple phone call. So however you record your guest's audio, I recommend you record your own with your normal means—even if your call-recorder is also recording you. This will ensure your own audio is consistent. This also reduces the chances of your call-recorder's capturing your voice in a lower audio quality. And such differences usually are noticeable. In many ways, technique and environment affect audio quality more than the gear itself. Please don't overwhelm your guest with pages of instructions; remember that they're doing you a favor. But here are some quick points you're welcome to copy the section relevant to your connection method. Don't worry if something goes wrong. I recommend giving them only the set of recommendations relevant to them. That will keep it the most simple. For your benefit, here's why I suggest those recommendations. Stay 4–6 inches (10–15 cm) from your microphone—Reverb and room noise increase with distance from the microphone. Wear headphones—This eliminates potential echo and audio feedback. Don't use speakerphone—Not only is speakerphone usually used to allow distance from the mic, it also usually creates audio feedback and over-amplifies the microphone. Go somewhere quiet. If you hear something, the microphone probably can, too—You don't have to educate them on acoustics. “Quiet” is good enough. Turn off notification sounds or set to DND—Skype, Slack, email, calendar events, and more notifications can create a distracting background noise, especially if the device making the noise is the same as what's capturing their voice. Try to stay still—This reduces the chances of rustling noise if they're wearing or holding the “microphone,” and reduces the chances of bumping the mic if it's detached. Don't worry if something goes wrong—This can help assure them things don't have to be perfect and they don't have to apologize for minor distractions. You may still have a guest who ignores or didn't read your recommendations. when you're connected. In such a case, focus on the smallest things you can do to return the best results. 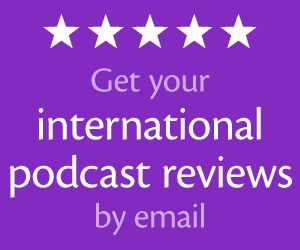 If your guest is a fellow podcaster, you can hold them to a higher standard and inform them when their audio may not be working as expected (such as having the wrong microphone selected). Your audience will accept lower audio quality as long as they can still hear and understand the guest. The most common fault I hear in interviews is mismatched loudness between the host and guest. This is much easier to fix if you've recorded your voice and your guest's separately. What I love about loudness normalization standards is that we finally have a way to measure and ensure consistent volume levels within and across episodes. This is more than “peak normalization.” It ensures the perceived loudness is consistent. The simplest way to match loudness is with Auphonic (online or desktop app). You can also normalize the loudness with your editing software. Skype, Hangouts (or Hangouts on Air), Zoom, Facetime (macOS and iOS)—These are the most popular VoIP tools for connecting with others in higher quality audio. Ringr, Zencastr, and Cast—These multi-ender VoIP tools handle the conference call and record each participant into separate tracks at the local source. Thus, there's almost no risk of bandwidth problems distorting the quality. They run through a browser or iOS/Android app. Ecamm Call Recorder for Skype (macOS), Ecamm Call Recorder for Facetime (macOS), MP3 Skype Recorder (Windows), Pamela for Skype (Windows)—These are single-app call recorders that do their jobs well, but are limited to specific apps. Also, because they integrate directly with the VoIP apps, any update has the potential to break the integration. Loopback (macOS), Audio Hijack (macOS), Voicemeeter (Windows), Virtual Audio Cable (Windows)—These apps can record or virtually reroute from any source on your PC. Because they're standalone, you can use them with any VoIP tool. JK Audio CellTap 4C Wireless Phone Audio Tap—This device connects to any mobile device's 3.5 mm TRRS audio jack (or adapter) and splits the audio into left and right channels to output to a stereo recorder via 3.5 mm TRS. Learn more in my video from NAB Show 2015. Skype Out / Skype In, Google Voice, UberConference, Anchor—These tools allow you to make or receive telephone calls. They may have recording capabilities, but they're using recording both sides at telephone quality and mixed into a single track. Great episode! I remember seeing the video where the kids walked in during the Skype interview. The look on the wife’s face was priceless. Her only job was to keep the kids out of the office. We’re definitely going to implement your list of suggestions for remote interview guests. Thanks for sharing! We have a reoccurring guest that thinks his microphone is so good it will only pick up human voices and block dogs barking. His dog is literally right next to him barking really loud and he continues to talk like it’s nothing. Thanks again for the great episode and the lists. When you were making your point about not using speakerphone, you overlooked another really good reason not to use it: speaker phones are single signal devices. When the person on the side of the speakerphone is talking they cannot hear the person on the other end of the conversation. Yes! Absolutely. That’s actually the most common reason I ask not to be on speakerphone even for non-podcast calls.